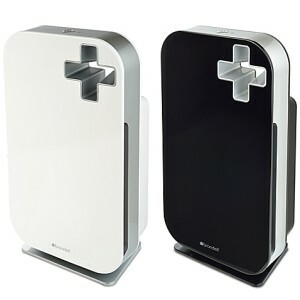 Brondell - O2+ : Air Purifier Review • The Air Geeks, reviews of air conditioners, dehumidifiers and air purifiers. The O2+ Source is a strong air cleaning system that captures various airborne pollutants to ensure that your room is free from smoke, dust, pollen, mold, odor, pet dander, and other irritants. 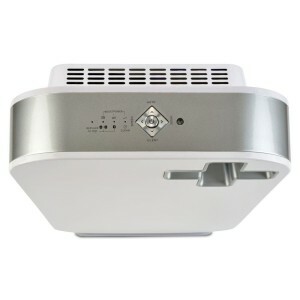 This unit is based on the highly effective True HEPA filtration mechanism. In addition, it is capable of capturing virtually all airborne pollutants before they find their way into your nostrils. If you have been struggling to eliminate air pollutants from your room without success, then you need to consider this air purifier. If you are planning to buy the O2+ Source, then you may be looking for reliable information about its features, performance, strengths, and weaknesses. If that is the information you are looking for, we have researched and compiled all the details that you need. Without wasting time, we will start with exploring its features. The original Brondell O2+ Source is a three-stage air purifier that utilizes the True HEPA filtration mechanism and granulated carbon technology to ensure that you enjoy clean and fresh air in a quiet environment. Its True HEPA filter is capable of capturing 99.997% of airborne particles and allergens. In addition, it removes even the smallest of airborne pollutants to ensure that the air in your room is truly clean. With this air purifier in your house or office, you can be sure that the air will be free from pet dander, dust, pollen, smoke, harmful VOCs, and other airborne particles. The O2+ Source utilizes a mesh pre-filter, activated carbon filter, and a True HEPA filter for its three-stage filtration process. To start with, its washable mesh pre-filter captures large airborne particles and helps to improve the lifespan of the activated carbon filter and the True HEPA filter. Its activated carbon filter reduces odors, smoke, and harmful VOCs to ensure that the air in your room is fresh and free from bad smell. Lastly, the True HEPA filter removes airborne particles and allergens such as pet dander, dust, and mold spores to mention a few. If you are looking for an easy to use air purifier, then you should consider the O2+ Source. It features intuitive controls and four different operating modes. In addition, the O2+ Source has an air quality indicator that adjusts the settings of the machine automatically to match the air quality of your room. This indicator enables the user to know the quality of the air in a room. red indicates that it is poor! Furthermore, this unit has a filter change indicator that alerts the user to replace a worn out filter with a new one. This helps to enhance the effectiveness of the air purification process. Like most air purifiers, this unit produces sound. In the lowest setting, the O2+ Source runs quietly without producing a disturbing sound. In the highest setting, the unit produces an audible sound. However, the sound produced is not irritating. 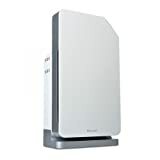 In case you are looking for an air purifier that you can use in your office or bedroom, then the O2+ Source is a suitable solution for your air purification needs. Effective air purification. This unit effectively captures various airborne particles to ensure that the air in your room is clean and fresh. Its True HEPA filter removes 99.997 % of airborne particles and allergens. Quiet operation. This unit runs quietly and can be used in bedrooms and other quiet places. Nevertheless, it produces an audible sound when it is in the highest setting. Poor at reducing kitchen smells. We have noted that the O2+ Source does not reduce smells from the kitchen effectively. Higher power consumption. Although the unit does not consume excess power, we noted that its power needs are slightly higher as compared to that of some units. I bought this air purifier because of my allergies first and foremost. It definitely does the trick. Good-bye hay fever. I also noticed that it has cut down on the amount of dust as well. Added bonus! Love the look of the machine and the convenience of the remote." First, let me say that their customer service is terrific. The remote that came with the original package didn't work and they replaced it immediately after one phone call. Got the replacement in a couple of days. Now, as to whether the unit does what it is supposed to, I have to defer to my wife's experience. She says she sleeps better when the purifier is clearing the air, that it reduces nasal congestion, and she sleeps better. I'll verify she sleeps better. Does the unit actually reduce airborne particles? Hard to prove, due to variations in weather here in New England. Every day is a different day and often a different season. I'd give it a 5 if I could prove that it did clear the air. :) YMMV." The Brondell O2+ Source is a strong air cleaner that utilizes reputable filtration technologies to clean the air in your house or office. This unit runs quietly and captures a large percentage of airborne pollutants. In case you have been struggling to eliminate pet dander, pollen, dust, odors, and harmful VOCs, then you should consider this powerful air purifier. In case the few drawbacks of the O2+ Source are not a bother to you, then you can proceed and get this strong unit for your home or office. At just $ 300, you can get this unit and forget about airborne pollutants. At the Air Geeks, we love something different!